This is an archive of the official patch note updates from the Bit Heroes forum. Related: a list of known bugs. Not what you're looking for? Try Frequently Asked Questions. New PvP, Gauntlet and Fishing events are now available. Higher discount sales will be appearing every day in the shop this week! New PvP and Trials events are now available. Loot drops are doubled during this week's GvG event. Shard baskets will be on sale at a higher discount every day this week. Fixed a bug where health bonuses would sometimes not apply to Familiars. Fixed a bug that caused strange results when a ricochet attack triggered after the death of a unit from a deflect. Exarkun Set weapon has a new set of skills. Countdown for the next Expedition event has begun. Non Mythic Expedition fusions have had their bonuses increased. Expedition fusions have had their procs adjusted to closer resemble a maxed augment bonus. Zarlock now also has 5% Damage Enrage. X5-T34M now also has 3% Ricochet Chance. New Zone: Eshlyn! Continue your adventure after completing Galaran. New Raid: Gorbon’s Rockin’ Ruckus! Collect legendary loot with friends after completing Eshlyn. New World Boss: Melvin Factory! Battle with friends and collect new loot and completing Eshlyn. New Feature: Augments! Improve your Familiars! All players will receive free augments upon logging in during this week. The amount of augments you recieve will be based on your level. Damage Reduction now has a hard cap at 75%. All +% damage bonuses will now correctly calculate together against Damage Reduction and effect Pet procs. All +% healing bonuses will now calculate alongside % damage bonuses and also effect Pet procs. Increased the effectiveness of Vend, Yuh, Kaun, Nox, and Kor Meta Runes. Fixed a bug with the Reconstitute ability for the Abhorence bow which was causing the value to be higher than it should be. Damage enrage cap increased from 10% to 25% of total health. Slightly increased the health and reduced the damage of Walogdr. Attacks from your team that also hit your team can no longer be redirected. Absorb has been added as a possible bonus for Enchants. Adjusted the procs on all expedition familiars. Defensive procs will no longer trigger from extra attacks given by dual strike or quad strike. Speed increased when holding down to add stat points. Players can now search for teammates by name and filter by players or familiars in the team selection screen. Reduced the difficulty of T9 Hard and Heroic world bosses. Reduced the difficulty of T9 Set Gauntlet/Trials from 500 to 440. Ability and proc descriptions will no longer apply +% damage bonuses in the tooltip since these calculations have been changed. This is just a text change, the bonuses will still apply. Maximum enchants and mounts increased to 100. Point cap from PvP battles has been removed. Increased the number of PvP enemy options when using multiple Tickets. Increased the spread of opponents found by Total Stats in PvP. Half of the PvP enemy options will now be intentionally weaker enemies. Every 50 turns in PvP will activate sudden death, increasing all damage dealt by 20%. The above PvP changes are not final and will continue to see adjustments in upcoming events as we watch how they play out. All skill damage increased by 50% for this weeks PvP event. +100% Item Find in World Bosses and Gauntlet has been added as a daily bonus for every day this week. Energy Packs and Token Duffles will be on sale at a higher discount every day this week. Common and Rare Familiars have 50% increased stats in this week's PvP event. Countdown for the new content has begun. +100% Item Find in Raids has been added as a daily bonus for every day this week. New Zone and Raid coming soon! With the new content, we’ve evaluated the balance between DPS and Tank players and will introduce changes to even the playing field between them. Existing events like PvP and GvG are also getting some updates with the content to keep them challenging and rewarding. Various other adjustments and additions will be coming with the content as well. Finally, with the new update we will be adding a new exciting feature related to Familiars! Russian has been added as a supported translated language. Countdown for the next GvG event has begun. All skill damage increased by 50% for this weeks GvG event. Improved performance of inventory, cosmetic selection, equipment selection, familiars and crafting screens. Players can now search for items in the cosmetic selection and equipment selection screens by name. Fixed a bug which caused the 1% damage bonus from Peppermint Ring to not correctly work. +100% Item Find in Gauntlet has been added as a daily bonus for every day this week. Double daily bonuses have now ended. New PvP, Gauntlet, Invasion and Fishing events are now available. All familiars are 200% stronger in this weeks PvP event. +100% Item Find in World Bosses has been added as a daily bonus for every day this week. Offerwall bonus has begun! Android and IOS users will receive 2x Gems on all offers for the next 24 hours!! Further reduced the difficulty of the "Oblitaran" zone dungeon. Common familiars are 100% stronger in this weeks PvP event. Reduced the difficulty of the "Oblitaran" zone dungeon. New sales at a higher discount will be appearing every day! Countdown for the next Invasion event has begun. New PvP, Gauntlet, Fishing and Expedition events are now available. Increased the drop rate of Dewdrop’s from Mallowdale. The following Friday (November 2nd) will not have the normal update downtime. Events and sales will still continue as normal. Note: Kongregate is joining Extra Life!! Donate for unique cosmetics!! Reduced the difficulty of Mallowdale raid on Heroic difficulty. Slightly reduced the difficulty of Mallowdale raid on Hard difficulty. Mallowdale raid boss will now always appear in the back of the battle. Slightly reduced the difficulty of Mallowdale raid on Heroic difficulty. New PvP, Trials and GvG events are now available. Tier 9 Set Gauntlet and Trials difficulty reduced to 500. Tier 9 Heroic world boss difficulty has been slightly reduced. Columbosim’s AOE proc damage has been slightly reduced and can no longer critically hit. Reduced the power and increased the agility for familiars Sprout and Sproulor. Reduced the damage spread for the skills of familiars Sprout and Sproulor. New Zone: Galaran! Continue your adventure after completing Cambora. New Raid: Mallowdale! Collect legendary loot with friends after completing Galaran. Reduced difficulty of World Boss Tier 8 Hard and Heroic. Daily bonuses have returned to their normal rotation. New offensive accessories are now available in the shop. All normal familiar fusion bonuses have been increased by 50%. Slightly increased the size of the familiar "Zarlock". Increased the deflect chance on Crypt Tunic from 2% to 3%. Two new Meta Runes have been added to the game. All players will receive the Beech cosmetic pet upon logging in this week. New Zone and Raid coming soon. Prepare yourselves! Common and Rare familiars are 75% stronger in this weeks PvP event. Due to unexpected server issues earlier this week, everyone who logs in within the next 7 days will receive a Super Scroll and 100 Gems. New PvP, Gauntlet, Fishing, and Invasion events are now available. Jelly Invasion! Work with your fellow players to defend the town from the Jelly horde!! Happy Kongiversary! All daily bonuses are doubled throughout the month of September. Talk with the friendly townsfolk for some special rewards! Equipment will now drop from Invasion battles. Prepare yourselves! Jelly Invasion is returning next week! Sudden death can now occur in PvP and Duel battles. Slightly reduced the amount of turns required for sudden death to occur. Our first Expedition has ended, but don’t worry! Most of the loot (and some new) will be available in upcoming Badge related events! Fixed a bug which was causing guild chat to be disable when players disabled world chat. Guilds can now be set to “Open” by the guild leader. This allows players to openly join your guild without needing to apply and be accepted. Newly created guild are set to open by default. Currently existing guilds are closed by default. New Feature: Expeditions! A new guild only adventure awaits!! Guild message board has been added to the guild screen. Guild chat has been moved to the world chat screen. Increased base guild member limit from 20 to 25. Equipment Set bonuses will now work across different tiers. Increased the amount of shields generated by Engulfing Artifact. Fixed a bug with Nebuleye where equipping 5 or more legendary items did not correctly grant the full damage reduction bonus. +100% Item Find and Experience has been added as a daily bonus for every day this week. Various backend tweaks to prepare for upcoming features. New PvP, Gauntlet, Fishing and GvG events are now available. +100% Item Find has been added as a daily bonus for every day this week. Summer Sale!! Free cosmetics upon logging in. Each day for the next two weeks will have a sale in the shop at a cheaper value than normal. New Guild content coming soon. New PvP and Trials and Invasion events are now available. +100% Experience has been added as a daily bonus for every day this week. Various backend adjustments and bug fixes. New PvP, Gauntlet, Fishing and Invasion events are now available. Zombo invasion is back! Defend the Town!! Quad Strike now adds 4 additional attacks, up from 3. Harvester Ancient Sword proc will no longer trigger single use abilities from Mounts and Sets. Various backend tweaks and changes to prepare for upcomming features. Various cosmetic bundles will be appearing this week to give players a second chance at acquiring them. Increased the amount of SP drained from the Chet Meta Rune. "Ignore Boss" and "Ignore Shrines" checkboxes have been moved to the top of the game settings. The first battle speed setting will no longer be affected by movement speed bonuses. A "Sudden Death" mode has been added to GvG battles which will cause all damage to double when the battle is going on for too long. Reduced the difficulty of Tier 8 Hard and Heroic Orlag Clan world boss. Slightly reduced the difficulty of Tier 8 Heroic Netherworld world boss. Quad Strike have been added to the character Info screen. This week will have a new PvP event each day! New PvP, Trials and Invasion events are now available. Nebuleye Mythic Shield now also grants 1% damage reduction for every legendary item equipped. Multiple bug fixes with the Harvester Ancient Sword. 4 piece Agony Set bonus proc rate has been increased to 10%. Various backend fixes and improvements. Various new enemies have been added to the Gauntlet. Due to another unexpected downtime earlier this week, everyone who logs in within the next 7 days will receive a Major Energy Potion and 100 Gems. Battle animations can now be disabled in the game settings. New PvP, Gauntlet, Fishing, and GvG events are now available. Defensive pets have been rotated in the shop. Due to unexpected downtime earlier this week, everyone who logs in within the next 7 days will receive a Major Energy Potion and 100 Gems. Fixed a bug which was allowing players to reroll the wrong tier 8 sets. New Zone: Cambora! Continue your adventure after completing Morgoroth. New Raid: Zol's Labyrinth! Collect legendary loot with friends after completing Cambora. New Offensive Pets are available in the shop. Fixed a bug which caused random attacks to not be used with AI. Slightly reduced the difficulty of Tier 7 World Bosses. When losing a battle in PvP, players will now gain a fraction of the winning points instead of losing points. Overall points gained from PvP has been slightly reduced to compensate for the above change. Shielding defensive Pets have been replaced with Healing defensive Pets in the equipment section of the shop. A new Absorb Chance Major Rune has been added to the game. Fusion and Victory animations can now be disabled in the game settings. Increased the size of the catching bar for higher rarity fish. Reduced the difficulty on Tier 7 World Bosses. Reduced the difficulty of Tier 7 Set Gauntlet and Trials from 210 to 200. Increased the drop rate of Rom Bits in Raids, Gauntlet, Trials, and World Boss. New Feature: Fishing! Travel outside of town to a brand new fishing island to meet Ishmael's wife Grella and compete against other players in events to see who can reel in the biggest fish. Join in our release of the very first, completely free to play event and test your luck at reeling in that ultimate fish. Turn in your fish for seashells to use in the brand new fishing shop where you can level up your fishing gear or trade in for exclusive cosmetics. Everyone receives 100 bait to start fishing, and 20 bait each day after upon login. New PvP and Gauntlet events are now available. New PvP, Trials, and GvG events are now available. New feature: Fishing! coming next week! New cosmetic bundle now available in the shop for a limited time. Major client and server changes and optimizations have been made to prepare for upcoming content. Improved the stats of the following legendary and set accessories: Baronet Edwin's Cranialoptic Regulator, Melvin Champ, Widowmaker, B.I.T. Chain, Gold Pendant, Astaroth Flag and Acropodium. Super Potion and Beginner Rune Bundle have been added to the "Other" tab of the shop. Players can now see the probability of certain rarities appearing from Eggs and Boxes in the shop by pressing the "?" at the top left of the screen when viewing the contents. New PvP, Gauntlet, and Invasion events are now available. Fixed a bug that caused mount bonuses to not be applied to your character. Fixed a bug that caused mount upgrade costs to not display correctly. Banned players will no longer appear in leaderboards. NOTICE: We discovered some players have taken advantage of a purchasing exploit, and we have worked hard to correct the issue. Thanks for weathering it out with us! Were given 20 Mount Guts and 50 Gems to everyone who logs in this week, and we will continue to investigate the exploit. As we learn more, further action may be necessary. Just a reminder to everyone that the use of any exploits in Bit Heroes will result in an account ban. Thanks to everyone for helping us maintain a fair playing field. Mounts have been added to the game! More information about mounts can be found in game. Every player who logs in this week will get free materials to trade in for your first mount! Daily login rewards have been adjusted. Materials in your inventory that can be traded can now be selected to view all the tradeable options for that material. Min/max buttons have been added to the exchange screen when exchanging a single item. Battle UI has been re-organized to make room for more skills. Various game screens have been adjusted to make room for Mounts. Offensive Accessories and Defensive Pets have been rotated in the shop. "Show Mount" option has been added to the game settings. Mount has been added as an exchange filter option. Added new bounties that reward Mount Guts. Various translation issues have been fixed. New PvP, Gauntlet, and GvG events are now available. This week will have two Gauntlet events. The first event will last for 2 days and will be ranked on Highest Clear instead of Points. After that event ends, there will be a normal 5 day even based on Points. Our first set Pet and Accessory are now available in the shop. Set items have the same drop rate as legendaries in the shop. Fixed a bug that sometimes caused battles to crash during a dual strike proc. Fixed a bug that sometimes caused incorrect unit positions in battle after a dual strike proc. Increased the drop rate of Demon Juice and Hobbit Foot. Ignoring a player will now also block Friend requests from them. Item locking has been added to the Craft screen. Pressing the lock icon at the top left will allow you to lock specific items. This will cause the item to no longer appear in upgrade, exchange, or reforge sections of the Craft screen. You can unlock items at any time through the same tool. Players can now filter World Boss searches by any boss, tier or difficulty. Bonus and Reduced text in battle will now display the percentage of change that was applied. Success and Failed text from familiar captures will no longer be hidden when the Battle Text game setting is disabled. Slightly improved the damage of BuvBoi and front enemy attacking pets. Fixed a bug causing Gold Find bonuses to not effect Treasures in dungeons. Fixed a bug that sometimes caused World Boss battles to freeze. Festive Sale! 20% off everything in the shop for a limited time during the holidays! Various serverside issues have been fixed. Winter items have been added to the cosmetic reward chest. Fixed the fusion size on Robobuddy 2.0 and Zingo. Search and filter options have been added to the upgrade and reforge sections of the craft window. New Defense Pets are now available in the shop. Morgoroth familiars can now appear in Trials. Added a + button next to the energy cost in World Boss rooms to let players gain energy without leaving the room. Players can now specify when item notifications appear on your screen based on friends, guildmates, or others in the game settings. Players can now use multiples of certain consumables at a time. Increased the healing value of the 3 piece Illustrious Artifacts set bonus. Increased the ricochet chance of the 3 piece Trugdor’s Call set bonus from 6% to 7%. Reduced the SP cost of the 4 piece M. A. R. U. set bonus from 3 to 2. Slightly increased the damage output of the 3 piece Taters set bonus. Changed the 3 piece Taters set bonus to attack weakest enemy instead of random enemy. Increased the shield regen value of the 2 set Jynx set bonus from 15% to 20%. World Boss rooms will no longer prioritize specific bosses at the top of the list when searching. Note: Last week there were some alterations on how damage increase and damage reduction mechanics worked. This resulted in an unintended fix of a pre-existing bug with the Obliteration set. The 4 piece bonus on this set was giving more damage reduction than intended, and is now working correctly. New World Boss: Netherworld! Battle with friends and collect new loot! New Defensive Accessories are now available in the shop. Regrouping in World Boss will now place you back in the team order you entered in. Slightly increased the drop rate of Hobbit Feet in World Boss. Increased the Dual Strike chance on Trugdor's Call 2 piece bonus from 3% to 4%. Increased the drop rate of Hypershards and Doubloons. Increased the overall stats of Mythic Familiars. Slightly reduced the difficulty of Tier 7 Heroic and Hard Orlag Clan World Boss. Various Zone dungeons have had their difficulty reduced. Increased the frequency of the staff healing skill being used on auto. Projectiles are now effected by battle speed. Capture success/failed text is no longer effected by battle speed. New temporary sales are now available. Fixed a bug with the Night Visage Mythic headpiece. Fixed a bug where PvP history was not being recorded. Highborn equipment has been changed to Epic rarity. Increased the amount of gems received from World Boss battles. Added a "/time" chat command to display the current server time. "Disable Auto Pilot on Death" has been moved to the top of the game settings list. Astaroth’s Diadem has replaced Melvin Champ in the Offense Accessory Boxes. Defense Accessories and Defense Pets have been rotated in the shop. Mythic rarity has been added as an exchange filter option. Fixed a bug where the E hotkey was not working for damage enrage. New Zone: Morgoroth! Continue your adventure after completing Aramore. New Raid: A Haile’of a Mistake! Collect legendary loot with friends after completing Morgoroth. Legendary Experience and Item Find Tomes are on sale! Slightly increased the drop rate of Legendary Schematics. Slightly increased the drop rate of Legendary and better items from Gauntlet and Trials. 0 SP Spear attack is now a projectile attack. Reduced difficulty of Gauntlet and Trials Tier 6 Sets. Reduced difficulty of World Boss Tier 6 Hard and Heroic. Slightly increased the drop rate of Doubloons. Don’t forget to check in on Oct 31st for some special Halloween fun! This week's PvP 'Pumkwim' event introduces a new Legendary pet. New PvP, Trials, and GvG events are now available! New Zone and Raid coming soon!! Prepare yourselves. A new leaderboard for Total Stats has been added. Fixed battle speed text from being cut off when too long. Various buttons have been added throughout the game to allow players to use consumables easier. New PvP and Gauntlet events are now available! New Offense Accessory is on sale in the shop. Increased the time before being disconnected for being idle from 10 minutes to 20 minutes. Movement speed bonuses will now also increase battle speed. "Disable Auto Pilot on Death" option has been added to the game settings. This week's mid-week Shop sale introduces a new Legendary pet (Skulldemort). New PvP and Trials events are now available! Offense Accessories and Defense Pets have been rotated in the shop. Increased the Crit Chance on Melvin Champ from 5% to 6%. Increased the Shield Regeneration on the Jynx set from 10% to 15%. Removed Robot Sprocket, Jumbo Syrum, and Mini Syrum from World Boss loot tables. This greatly increases the chance of Hobbit Feet dropping due to being the only possible material drop. Ninja invasion head cosmetics will now correctly hide your hair. New PvP, Gauntlet, and Invasion events are now available! Energy cost for World Boss has been reduced from 25 to 20. Reduced the difficulty of Hard and Heroic World Bosses on Tier 5 and below. Slightly increased the drop rate of Schematics and Hobbit's Feet from World Bosses. Increased the amount of Gold and Experience gained from World Bosses. This week's mid-week Shop sales introduces two new Legendary pets (Wuvboi and Buvboi). See Kong'iversary (2017) for details on the week's sales. New Feature: World Boss! Participate in co-op realtime battles with other players for new loot! New offensive Pets are available in the shop! 10% discount for a limited time. Staff 1 SP damage skill (Eruption) has been changed to damage the weakest enemy instead of the closest enemy. Increased the overall effectiveness of single target Healing Skills. Increased the overall effectiveness of front line Damage Skills. Adjusted the min-max values for all Staff Skills. Players can disable World Boss Requests in the game settings. This content update introduces the Lunar Guardian and Jynx sets. New limited time sales this week. Fixed an issue which caused item tooltips to extend past the bottom of the screen. For non-mobile users, pressing "E" will now activate Enrage during your turn in battle. Players can now disable Enrage from automatically being used by disabling "Auto Enrage" in the game settings. Players can now ignore the boss when doing a dungeon on Auto by enabling "Ignore Boss" in the game settings. Locked treasure chests in Hyper Dimension now have a slight chance to contain a Hypershard. Locked treasure chests in Woodbeard's Booty now have a slight chance to contain a Doubloon. This week's mid-week Shop sale introduces a new Legendary accessory. A new limited-time Mega Defense Accessory Box can now be purchased in the shop! This box contains a guaranteed Epic defense accessory and is available this week only (The new legendary accessory in this sale will eventually become purchasable again). Absorb and Evade will now trigger "When you get hit" and "When you hit an enemy" Pet abilities. This week's PvP 'Snut' event introduces a new Legendary pet. Familiars have 50% increased stats during this weeks event. Previous Offense Accessories are back! The new Offense Accessories have been temporarily replaced with the old ones. These will occassionally switch along with other shop items that were previously removed. Widowmaker’s 5% Life Steal has been changed to 3% Empower Chance. Enchants can now be exchanged. Destroying an Enchant will also exchange the Enchant, giving you extra materials based on how many rerolls you have done on that Enchant. Total Stats indicator has been added to the team building screen. Healing Pets are back! Shielding pets have been temporarily replaced with Healing pets. These will occasionally switch along with other shop items that were previously removed. Familiar Capture screen will now take into consideration how many of that Familiar you have in your stable. When using stat points, you can now press and hold on the adjustment buttons to use your points quicker. Alternatively, for non-mobile users, you can hold the Ctrl key to use 10 points at a time. Enrage will now automatically be used by AI controlled units. Large Offense Accessory Boxes and Large Offense Pet eggs are now on sale! Improved the bonus on the Chet Meta rune. This week's PvP 'Grim' event introduces a new Legendary accessory. Zombo Invasion! Work with your fellow players to defend the town from the Zombo horde!! New Feature: Enchants! Find and identify enchants throughout the game to improve your character. Enchants can be aquired from Zones, Raids, Gauntlet, Trials, and event rewards. New Bonus: Empower Chance! Chance for skills to be twice as powerful. New Bonus: Damage Reduction! Reduces all damage received by a percentage. New PvP, Trials, and Invasion events are now available! Empower Chance, Damage Reduction, and Absorb Chance have been added to the character Info screen. Two new Major Runes (Isa + Tol) have been added to the game. Reduced the gold cost for upgrading materials at the crafter. A new leaderboard for highest Invasion wave clear has been added. Sort options for Familiars and Fusions will now display the color of the rarity. You can now disable Battle Text in the game settings. “Bonus” and “Reduced” battle notifications are now smaller, no longer have audio, and display in a different color. Health percent bonuses will now regenerate an equal percentage of your missing health per combat phase. “Damage Return” has been reworked and renamed to “Damage Enrage”. Instead of returning the damage directly, your unit will store that damage on themself as a bonus. Each unit can store up to 10% of their maximum health in damage. During your turn, you can use this stored up bonus to enrage your next ability, increasing its potency. Various Grim Ward accessories have been adjusted to compensate for this change. New PvP, Gauntlet, and GvG events are now available! Small and Large Defense Pet eggs are now on sale! Updated animation on Eluria Staff. Removed the "Change" option when viewing other players Runes. Small and Large Offense Accessory boxes are now on sale! Slightly improved the Set bonuses for Divinity, Ares Legacy, Trugdor’s Call, and Taldrilth’s Artifacts. Time Played in your Info panel will now display slightly more information. Ticket Pouches are now usable directly from the PvP screen. Legacy Offense Accessories and Defense Pet eggs are temporarily available to purchase this week! Fixed an issue where unique Hyper Dimension Epic items were not dropping. Daily PvP bonuses will now also effect GvG. Several daily bonuses have been adjusted. Small and Large Defense Accessory Boxes are now on sale! Players can now ignore shrines in the game settings while doing an auto dungeon. Friend requests will now display more information about the player. Sorting options have been added to friend requests and guild applications. Items can now be used immediately after trading for them at the crafter. Small and Large Offense Pet eggs are now on sale! Various enemies and bosses have been added to the Gauntlet. Fixed a bug where shielding was not benefiting from critical hits. Increased the drop rate of Hypershards in Hyper Dimension and Tier 5 Trials/Gauntlet. Cosmetic Chests have returned to the shop! Reduced Gem cost for purchasing items from the merchant in Dungeons. Merchants, goblins, and locked treasure chests in Raids now have a slight chance to contain a Legendary item. You can now select which rarity of items you want to auto-decline from dungeon merchants in the game settings. Major Item Find Scroll, Major Experience Tome, Major Gold Potion, and Major Speed Kicks can now appear as a flash sale. This week's PvP 'Crem' event introduces a new Legendary pet. New Zone: Aramore! Continue your adventure after completing Ashvale. New Raid! Woodbeard's Booty! Collect legendary loot with friends after completing Aramore. New Feature: Familiar Stable! Board extra familiars here for bonuses to their stats. New Mechanic: Shielding! Pets and other features can grant shielding to teammates in battle. Shielding acts as an additional health bar that will deplete before your health gets touched. You can have up to a max of 50% of your total HP in shielding. New defensive Pets are available in the shop! The "Aerial Assault" Axe skill will now drain health from its targets. Various cosmetics have been added to the event cosmetic reward chest. Item tooltips will now display the item's Tier. Gauntlet and Trial difficulty tiers now reflect the highest possible rarity that can drop from that difficulty. You can now sort Equipment by Tier when changing an equipment slot. Tier 5 Set items can now be Reforged to Tier 6 when they are fully upgraded. Slightly increased the drop rate of Schematics. All Raid difficulties now give the same exp and gold. This value is equal to what Heroic previously gave. Increased the proc rate on the Ares Legacy set bonus to 15%. Reduced difficulty on various dungeons. This week's PvP 'Colonial' event introduces a new Legendary accessory. Our first GvG Event is now over. The next one will begin in one week. Get your Guild prepared! This week's PvP 'Nerder' event introduces a new Legendary pet. GvG is finally here! Compete against other guilds for special guild prizes! Guild Halls have been added to the game! Hang out with your guildmates and customize your guild hall. Unlock special cosmetics from leveling up your guild and competing in GvG. Guild Perks have been added to the game. Earn special guild wide bonuses for competing in GvG events. Guild Perks can be unlocked by earning Guild Bucks in GvG events. Pets and Accessories can now be upgraded by using materials gained from exchanging extra Pets and Accessories. Only Pets and Accessories with upgrade paths can be exchanged for these materials. Guild Shop Pets and Accessories do not have upgrade paths. To compensate for people that have made previous purchases and exchanged Pets or Accessories already, we have implemented a system to give you an amount of Pet and Accessory materials upon logging into the game. For more information on how this is calculated, please visit the forums. New accessories have been added to the shop. This weeks Gauntlet event will be ranked by highest clear. You can now trade for Badges with coins at the crafter. Average Badge Pouch has been added to the guild shop. Players can now use up to 5 tickets at a time when entering PvP. Movement arrows have been added to the team selection screen to allow users to move units around without dragging them. GvG Wins, GvG Losses, Gauntlets Completed and Trials Completed have been added to the character information screen. Damage and Speed bonuses no longer adjust your current stats, but instead adjust values during combat. This change was made to allow these bonuses to be equally valuable to all types of damage builds and balance out other bonuses. Reduced the gold cost for reforging items. Improved loading times for various screens of the game. Increased the crit chance of Widowmaker by 1%. A new limited-time Mega Egg can now be purchased in the shop! This egg contains a guaranteed Epic pet and is available this week only. This week's PvP 'Mirror' event introduces a new Legendary accessory. Common and Rare Familiars have 50% increased stats in this week’s PvP event. Major Item Find Scroll, Major Experience Tome, Major Healing Potion, and Major Revive Potion are now on sale. Various cosmetics have been added to the cosmetics reward chest. This week's PvP 'Nemo' event introduces a new Legendary pet. Large Defense and Offense Accessory Boxes are now on sale! Fixed a bug that would sometimes cause Gauntlet battles to freeze. Battles that are frozen will now attempt to fix themselves after a short delay. You can now disable Duel Requests in the game settings. You can now decline all pending friend requests. You can now force battle status bars to overlay on top of units by enabling "Overlay status bars" in the game settings. You can now select a player's name when a notification appears to view their profile. You can now specify which rarity of Familiars you want to decline when declining familiar duplicates. Legendary and set items are now disabled by default in the exchange filter. Cosmetic chests will now display which cosmetics you have already unlocked. Your friends list will now display the amount friends you have. Slightly adjusted status bars and unit positions in battle to prevent visibility issues. This week's PvP 'B.I.T.' event introduces a new Legendary accessory. Large Defense and Offense Eggs are now on sale! Item notifications will now only appear the first time a player obtains the item. Various languages issues have been fixed. Numbers in the player information window now show their full amount. (5/11/2017): A pop-up window now appears when you disconnect during a dungeon. (5/15/2017): World chat channels have been added. A new bug causing havoc on event ranking has also been fixed. (5/15/2017): A pop-up window for switching servers now appears when you attempt to duel someone in a different server. This week will have 3 short pvp events, each with different team size restrictions. Leaderboards now show the top 100 players, up from 50. Weekly updates will now occur on Friday instead of Sunday. PvP and Trials this week are only 5 days long due to this. You can now view how much experience each guild member has contributed to the guild with the Contribution button in the members tab of the guild. You can now select the quantity of items being purchased in the guild shop. Various issues with specific languages have been fixed. (04/27/2017): Bit Heroes is now available for pre-registration on Google Play. Players who pre-register receive the Droid pet cosmetic, 10 PvP tickets, 100 Energy, 100 Gems, and 10000 Gold. Common Familiars have 50% increased stats in this week's PvP event. This week's Gauntlet event will be ranked on highest clear. Fixed a bug which caused ricochet procs to gain multiple bonuses. Fixed a bug which caused Gauntlet and Trials leaderboards to update inaccurately. Notifications will now only appear lower on the screen when the primary currencies are being displayed. 5 new selectable languages have been added to the game. French, Italian, German, Spanish and Portuguese. You can select your preferred language by going to the Language tab within Settings. A font size reduction has been applied to long names in the leaderboards/party screens. Familiars have 25% increased stats in this week's PvP event. Major Item Find Scroll, Major Experience Tome, Major Gold Potion, and Major Speed Kicks are now on sale. 20% off! Two new leaderboards have ben added to the NPC in town. One for Trials highest all time clear, and one for Gauntlet highest all time clear. Increased the amount of dungeon ad chests available per day from 4 to 6. Cosmetics purchased from the shop will no longer display a notification. You can now exchange previously inserted runes. Players can now take leadership of a guild after a certain period of time of the leader being offline. This timeframe depends on your current ranking in the guild. Officers can take leadership after 2 weeks of the leader being offline, members 3 weeks, and recruits 4 weeks. This gives the higher ranking players priority over the leadership role. When allowed, a "Mutiny" button will appear next to their name in the members section of the guild. The settings window has been redesigned to create more room for new options. "Reduced Effects" has been added to the game settings. Turning this on will disable white flashes on text and units in battle, as well as particle effects. Large Defense and Offense pet eggs are now on sale! Hyper Dimension Hard and Heroic difficulties have been reduced. Tier 6 Gauntlet and Trials difficulty has been reduced from 120 to 110. Various quest bosses have had their difficulty reduced. A new Cosmetic Chest has been added to the shop. This chest will allow you to purchase a random Cosmetic of previously available shop items. A new Gauntlet boss has been added to the rotation: the Juppiomenz character (developer account). The developer describes it as a rare spawn, similar to Olxa or Gobby. Demon Potion has been added to the random cosmetic chest. Fixed a bug that caused piercing attacks to effect dead targets. Agility has been reworked. Turn rates are now based on a difference between power and agility. This will allow players to use different builds without losing any overall damage. (Yes this affected familiars too). In the Guild panel, '? Members Online' has been changed to '? Guildmates Online'. This week's Trials 'Boogie' event introduces a new Legendary pet. All Epic boosts are now on sale! Fixed a bug where only equipment from Bit Valley was appearing from dungeon corpses. Fixed a bug that sometimes caused dungeons to not generate correctly. Attacks deflected after a redirect or ricochet will now correctly return to the attacker. Notifications will now appear below your currency tabs when they are visible. The raid selection window will now default to your last summoned raid. Dungeons will no longer generate art that can hide objects. Trading for Set items at the crafter will no longer display a global notification. You can now press the number keys on your keyboard to choose a target for a selectable skill. This week's Trials event will be ranked by highest clear. Fixed an issue where reforging epic items would disconnect you from the server. A new type of treasure chest can now be found in dungeons. You can watch a short ad to open these chests, which contain multiple equipment pieces, gems, rune fragments, and more. Only 4 of these can appear per day. Abilities for Robby and Olxaroth have been changed. Various new trade options for PvP Coins have been added to the crafter. A new Kongregate logo animation has been added. Damage dealing pets can no longer be evaded or blocked. PvP matchmaking will now prioritize recently logged in players as opponents. Optimized PvP matchmaking and various other parts of the game that were very slow. Redesigned all bounties that require you to quest in Hard difficulty. Added more bounties that require you to defeat opponents in PvP. Fixed an issue that was causing duels to crash at the end of the battle. A new Meta rune has been added to the trading section. Redirect Chance has been added to the character information section. Fixed a few visual errors with item tooltips. An overall balance pass on certain skills has been done. Redesigned the SP costs of weapon skills to give players more options during combat. Added multiple new rank brackets for PvP, Gauntlet, and Trials events. Slightly increased the drop rate of hyper shards in raids. Set items will now give a new crafting material when exchanged. Players that have already exchanged set items can contact us to receive the materials they didn't get previously. Players can use the above mentioned crafting material to create a new, random set item at the crafter. Increased the effective bonus of fused familiars to be more similar to their equivalent accessory bonus. 3 new legendary schematics have been added to the game. Increased the drop rate of legendary schematics to compensate for the above change. If an opponent dies from the first attack of a targetable dual strike attack, the second attack will now grab a new target. Movement speed minor runes (Dar) will now give gold find instead. The duel bug introduced in the last update has been fixed. The PvP optimizations were soon removed after the update. Two full energy/shard/ticket/token refills were given to compensate for excessive server lag post-update. The Set chest requires 1 Harmony Orb, 3 Hyper Shards, 10 Epic Materials and 250,000 gold. New set items have been added to the T6 Trials/Gauntlet loot table. The Trugdor's Call set has a bow, offhand, and headpiece. Increased the SP drain from Chet runes. 2 new Meta Runes have been added to the trading section at the crafter. Updated the world chat word filter. Added a terms of service agreement to world chat. Various UI adjustments have been made to prepare for upcoming features. A new Gauntlet boss has been added to the existing rotation. The new boss uses the legendary Kov'alg set from Tier 5 Trials/Gauntlet. The GvG tab has been changed. It now shows the Event name and a greyed out Enter button. (02/24/2017): Two achievements (Easy/Medium) have been added to the Kongregate version of Bit Heroes. You can now exchange runes for 20% of their rune fragment cost. Sets and Runes have been added as exchange filters. You can now purchase items in bulk by selecting a quantity at the bottom of the shop. New PvP and Gauntlets events are now available! Tier 6 has been added to Gauntlet and Trials. New Legendaries have been added to the Tier 5 / Tier 6 Gauntlet and Trials loot tables. Hypershards now have a small chance to drop from Tier 5 / Tier 6 Gauntlet and Trial bosses. All Large Eggs and Boxes are now on sale! Large Defense Accessory Box and Large Offense Pet Egg are now on sale! Two new Major runes (Pire and Vex) have been added to the trading section. This week will have a 4 day Gauntlet event, followed by a 3 day Trial event. Both of these events will be ranked by highest clear and have a special cosmetic point reward! Large Offense Accessory Box and Large Defense Pet Egg are now on sale! New PvP and Trial events are now available! Keyboard controls have been added! You can use WASD or the arrow keys to move around. BACKSPACE and ESCAPE act as a "Back" or "Exit" command. SPACEBAR and ENTER act as a "Confirm" command. Adjusted matchmaking for PvP to look for a larger spread of opponents based on your total stats. Players with high total stats will have a lower adjusted point value in PvP than previously. Point rewards have been lowered to compensate for this change. Increased the maximum amount of points you can receieve from fighting someone in PvP. Opponents in PvP are now ordered from weakest to strongest. This can be reversed by pressing the "Stats" button when choosing an opponent in PvP. New Mystery PvP and Gauntlet events are now available! Various performance improvements have been made. Fixed multiple issues when trading in Energy for Shards. Potions and other cosmetics have been added to the cosmetics reward chest. You can now view the possible rune options when trading in rune fragments. Shields and Offhands are no longer separate cosmetic selection types. Fixed a bug where players could drag a private message window off screen. Fixed a bug where friends / guildmates were not correctly updating when selecting a team. You can now duel other players while battles are disabled. New PvP and Trials events are now available with special new years cosmetics! Tier 4 Legendaries have been added to the Tier 5 Trial/Gauntlet loot table. Day 10: Free Ugly Holiday Sweater and Holiday Cap cosmetic given to all players above level 1. This cosmetic can be used after reloading your game. Day 9: Free milk and cookies given to all players above level 1. This consumable can be found in your inventory after logging in. Day 8: Free holiday pet cosmetic "Rudy" given out to all players above level 1. New zone "Ashvale" is now available to all players who have completed "Lakehaven". New raid "Hyper Dimension" is now available to all players who complete "Ashvale". The Gauntlet is now available! Defeat waves of enemies and compete for special rewards! The Gauntlet will appear in the place of Nyxn's trials during certain events. New defensive accessories have been added to the shop. An overall balance pass on pets has been done. No negative effects have been made, but damage pets and a few healing pets have had their values increased. You can now purchase damage pets in the shop. Major Item Find Scroll and Major Experience Tome are now on sale. “A Bit of Holiday Cheer” event has started! New PvP and Trials events are available! This weeks PvP event will allow teams of 5. This weeks Trials rankings will be based on highest clear. This week will have 3 rapid PvP events, each with different Minor runes to obtain and different team size restrictions. Large Egg and Small Egg are now on sale. You can now trade for Minor runes at the crafter. New PvP and Trial events are available! This weeks Trial rankings will be based on points earned instead of highest clear. Rune fragments have been added as daily login and bounty rewards. Ties can no longer occur in PvP and Trial rankings. Players can now trade in their energy for raid shards at the crafter. Runes are now available! Further customize your character with Runes earned through events. Reforging is now available at the crafter! Quickly change the stats of your gear to a different upgrade path. Trials are back! Earn Runes and collect new loot! Accessories are now currently on sale in the shop! Agility has been redesigned. Units will no longer regenerate SP at an equal rate in battle. You will now earn half of an SP bar per turn. All players above level 1 have received 1 free stat reset due to these changes. You can find this in your inventory under the consumables section. Increased the spread of available targets in PvP. New trading options have been added at the crafter. Exchange larger quantities of item materials, and create Runes with fragments earned through events. Points earned from being defeated or quitting in trials is now based on your current progression in the dungeon. Critical hits are now calculated per attack, instead of per hit. This mostly only effects AOE moves that triggered critical hits on each individual target. Spread heals can now cause critical hits. Various familars and accessories with lifesteal have been slightly increased. PvP will now match you with players near your current total stats instead of your level. You may now change the visual appearance of your equipped accessory to another accessory that you have previously owned. To do this, you must first select your accessory equipment slot and then click the cosmetic button. PvP and Trials rewards will now automatically be rewarded after logging in. Daily bonuses have been adjusted. Mirror pvp event is now available! You may use teams of 5 in this event, but you cannot switch teammates in battle. Set your formation wisely! You can now mouse over units in battle to see their health bar easier. Pots of gold and gems no longer require you to stop to loot. Battle speed can now be increased to 3x and 5x (up from 2x and 3x). Movement speed in dungeons and towns has been slightly increased. Fixed an issue that was causing some players to get stuck in dungeons. You can now use up to 2 tickets at a time when entering PvP. You will have 5 less targets to choose from if you use 2 tickets. You can now use up to 5 tokens at a time when entering Nyxn's Trials. Loot for trials has been adjusted for this. Less items drop, but each item has a higher chance for better rarity. The above changes were made to gives players that don't want to compete or don't have enough time, a way to use their tokens and tickets faster. Fixed an issue which was causing trial rankings to not display correctly on the leaderboard. Fixed an issue where trial points were sometimes not being recorded after losing. Highest default trial difficulty has been adjusted to be closer to your current progression. Backend adjustments have been made to ease the server lag when a new day occurs. You can now decline locked treasure chests to have them go away. Decline merchants and decline treasures has been added to the game settings. These will skip merchants and locked treasure chests when auto pilot is enabled. If you are about to be disconnected from being idle, a confirmation message will now appear that will give you the option to stay online. Guild shop pets and accessories have been improved. Fusion is now available! You can fuse familiars to make them stronger by finding schematics throughout the world. Prof. Haile can be found in the fusion room the the left of crafting. You can check out fusion by talking to him or using the fusion button in the Familiars tab. Nyxn's Trials are now available! Compete against others to earn and find legendary loot. Check out Nyxn and the staircase to the Trials across the town bridge to the bottom right of the map. New Healing Pets are now available in the shop! The town has been expanded to make room for new and upcoming features. Towns can now support up to 20 players per instance. Fixed a bug that was causing minor health and revive potions to not drop in dungeons. Minor health and revive potions now restore 40% health (up from 25%). Average health and revive potions now restore 60% health (up from 50%). You may now have up to 100 players in your friends list (up from 50). Guild chat no longer plays a sound when you receive a message. Removing friends will no longer scroll back to the top of your friends list. Fixed server issues which were not allowing players to reconnect into dungeons after being disconnected. Grim pvp event is now available! Teams of 4 are allowed to enter this event! You can now filter out specific types and rarities of equipment when exchanging. Pets and accessories are disabled by default. Slightly increased the drop rate of legendary items. Adjusted loot tables to have legendary items drop more frequently on Hard and Heroic raids. Fixed an issue where dungeon bonuses were not being correctly multiplied with daily and consumable bonuses. 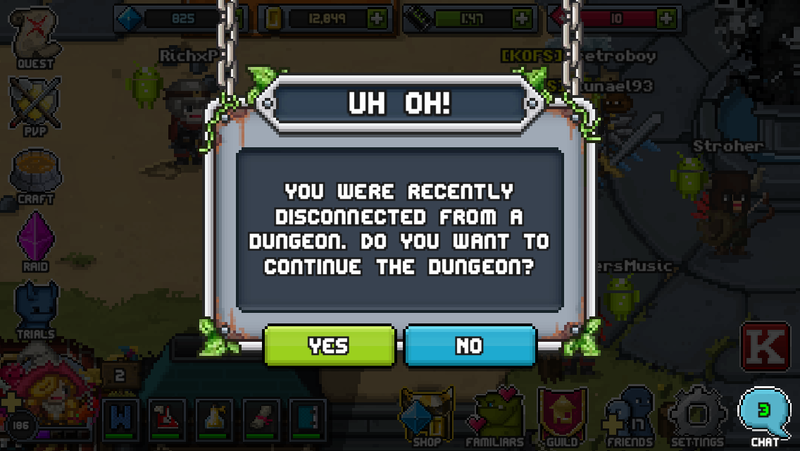 You can now reconnect to dungeons within a short period of time after being disconnected. If you are disconnected during a battle, the battle will complete as if you had auto-pilot enabled. Whenever a DC occurs during a dungeon from here on out, you'll have 15 min to reconnect. Layout will be the same, monster count will be where it was, though monsters and items may shift around a bit. If you DC in the middle of a battle the AI will finish the fight for you. If it wins, you'll spawn in the dungeon again. If you lose, you'll spawn in town as per normal deaths. Increased item find chance on Hard and Heroic raids. Increased the chance for legendary items to drop with item find bonuses. Redesigned Astaroth's skillset and stats. Slightly increased the daily bonuses on Saturday and Sunday. The game will now check for video ads more frequently. Formal PvP event is now available! Earn cosmetic formal attire in this pvp event! Special dungeons will now appear on each zone after collecting 9 stars. These dungeons contain all of the bosses from the zone and have a chance to drop special cosmetics. More content after completing a zone! Players who have completed Lakehaven may now enter our first raid "Astaroth's Awakening". The dark lord Astaroth is attacking the realm, gather your best fighters and join in for some epic fights, new familiars, and awesome loot. You can now earn small rewards from watching video ads. Video ads will appear randomly while you are in town. Dueling is now available! Challenge other online players for realtime combat. A balance pass on all ability values has been done. This is an ongoing process and may not be final. Increased common familiar persuade chance from 30% to 40%. Reduced guild level requirements on a few of the guild shop items. Encounter and Boss dialog will now only show up once ever. Fixed a few issues which caused players to be disconnected during battles and dungeons. Chests, Eggs and Box's no longer appear in flash sales. Backend updates to fix battle and dungeon freezes. Serpent PvP event is now available! Eternal PvP event is now available! Cosmetics now available! Change your appearance to look like items you have found. Don't worry, items you have exchanged or found prior to this update will still be able to be used as a cosmetic. Daily Bounties have been added to the game! Each day you log in, two new bounties will be added to your board up to a max of 10. Different rarities are displayed with the color of the title of each bounty. Beta PvP event shortened. As we approach the public release of Bit Heroes, we want to keep the beta event exclusive to early access players. This will not be something that happens on future events. Players will now gain 1 maximum energy per level. All accounts should update with correct max energy as of update. Energy costs and bonuses for "Hard" and "Heroic" dungeons have been reduced. Energy costs should now show as 10 Energy for Normal, 20 Energy for Hard and 30 Energy for Heroic. Bonuses adjusted to match. ↑ New content starts after 14 days.